Shellfish allergy bracelets or shellfish allergy jewelry is probably the last thing on anybody's mind when dealing with moderate to severe shellfish allergies. After all, bracelets, necklaces and anklets may not seem to serve any purpose beyond being decorative. However, when it comes to a chronic condition like a shellfish allergy, being quickly identified as having this medical condition is often necessary. 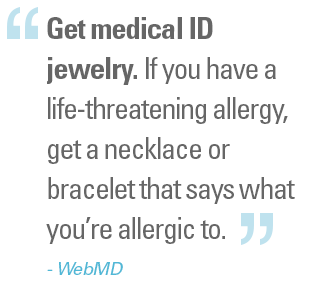 This is why shellfish allergy bracelets are often worn. They are not just to inform anyone about the wearer's health status, but also to alert people, such as rescuers, first-aid staff and medical professionals of the appropriate action to perform when the wearer is involved in an emergency. When shellfish allergic people were first encouraged to wear shellfish allergy bracelets, some people were not very supportive of getting "tagged" as shellfish allergic. However, the fact that the bracelets were medical alert tags and could help save a life in an emergency quickly showed why it was a necessity. Today, even with modern technology, it still is. Shellfish allergy requires special medical care and attention. Along with fish, shellfish allergies are the most common adult-onset food allergies. It’s estimated that between 2 and 3 percent of American adults suffer from allergies to one or both. Allergic reactions to shellfish are unpredictable, sometimes occurring long after a person has consumed the allergen and has shown no other symptoms. In addition, allergic reactions to shellfish often become more severe with each exposure. Signs and symptoms of shellfish allergy range from mild to severe and can include tingling in the mouth, abdominal pain, nausea, diarrhea or vomiting, congestion, wheezing, skin reactions including itching and hives, swelling of the face, lips, tongue, throat, ears, fingers or hands, lightheadedness, dizziness or fainting. In the most serious cases, shellfish allergy can cause anaphylaxis — a severe, life-threatening reaction, which requires treatment with an epinephrine (adrenaline) shot and a trip to the emergency room. In some emergencies, the shellfish-allergic person may not always be able to speak or communicate. He or she may even be completely unresponsive. Furthermore, an emergency may occur when a relative or a friend who has knowledge about the allergic person's shellfish allergy may not be around. In these cases, a shellfish allergic bracelet can silently inform the attending medical personnel of the disease and what may have brought on the attack. Shellfish allergy can be a tricky condition to have, oftentimes resulting in severe reactions amongst adults who have never presented with a shellfish allergy in the past. People with shellfish allergies should carry injectable epinephrine (such as an EpiPen) at all times. But in the event you are unable to communicate your needs in an emergency, or administer the injection yourself, a shellfish allergy bracelet could make the difference in getting the treatment you need. Always ensure that you or your loved one is wearing a shellfish allergy bracelet at all times and especially before leaving the house. If necessary, pack an extra bracelet during special trips, particularly if you will be traveling alone or will be leaving town for a long period of time. Always wear the bracelet where it can be spotted easily and avoid taking it off. Great new designs won’t cramp your style and it can mean the difference between living a healthy life and suffering major medical consequences.